1. Integrate into practice the current standards of care for HIV pre-exposure prophylaxis (PrEP). 2. Identify optimal ART treatment regimens. Participants must login to the teleconference to view presentation, participate in interactivity and note session code provided at the end of the presentation. To claim credit for this activity, participants must complete an online program evaluation and must update their accounts to properly reflect their month and day of birth and their correct NABP E-Id. Registration with a proper disclosure of your NABP E-Id is a requirement for receiving Continuing Pharmacy Education. 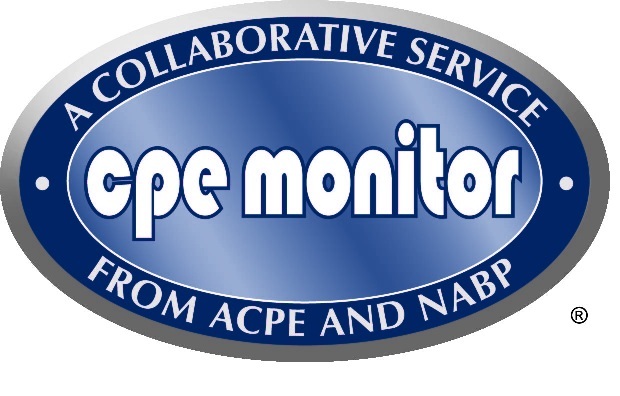 To register with or look up your NABP E-Id, please click on the CPE Monitor logo below to be directed to their site. Evaluations should be completed within 30 days of the live event to ensure transmission to the NABP CPE Monitor. Any credit submitted more than 60 days from the date of the event will not be accepted by the CPE Monitor. If you would like a paper statement of credit, you may print an individual statement or a transcript from your NABP e-profile.